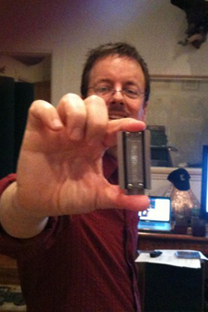 John Jennings has a mission: "I want to put ribbon microphones in the hands of everyone who records music." John got his start, like so many audio professionals, as a guitar-player and singer on the east coast. Tempted westward by friends and opportunities, John moved to Hollywood in 1990, playing the Los Angeles club circuit and spending time in studios tracking with various bands. In 1992 John took a detour into the corporate world, becoming VP Sales & Marketing for a Los Angeles based data and communications firm and playing music in the evenings. During a recording session in 1996, he came across a modified U-87 that sounded "unbelievably good." After an introduction to the man who modified the mic, David Royer, John left the suits & ties behind and teamed with David and another friend to start a new pro audio company - DVA. DVA ultimately closed due to production problems, but David had talked a lot about ribbon microphones during its brief existence. Between that influential commentary and an interview with Eddie Kramer in which Eddie said he always had a ribbon mic in the mix on Jimi Hendrix's guitar cabinets, John's life was changed. John and Dave met Rick Perrotta and Rafael Villafane in late 1996. Digital recording was replacing the tape machines of the day, and the guys realized that there was a real need for the warmth and analog-like musicality of ribbon mics in the upcoming, more clinical world of digital recording. After much discussion and numerous business plans, Royer Labs went into production in 1998 and John got busy handling the sales and marketing. The Royer R-121 was unveiled at the 1998 AES show, ultimately leading to the re-emergence of ribbon microphones around the world. Art Noxon teaches the acoustic sessions in Bruce Swedien’s workshop for recording engineers: In the studio with Bruce Swedien. 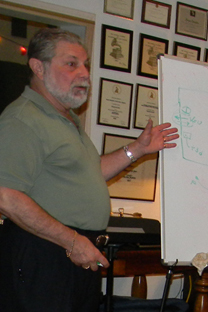 Art began teaching advanced recording studio acoustics in Bruce’s first Critical Listening workshop, January 2009 and has continued to teach every class since. Bruce opens up his personal studio every few months to mentor a group of recording engineers who have come from all over the world to learn his recording spice secrets. For the first 3 days of each 7 day workshop, Art teaches Bruce’s version of studio acoustics to the engineers. Because the typical student is well schooled and a seasoned recording engineer, the class runs at a very fast pace and finishes at the cutting edge of recording studio acoustics, which is exactly where Bruce works. The class builds on what is contained in the current edition of The New Audio Cyclopedia. A binder filled with supplemental information; along with class notes is provided. Topics covered during the 15 hour short course include: Studio layout and construction, Haas effect, acoustic/sound waves, microphone design and use, room mode interaction with microphone and speaker placement, structural bass range soundproofing and sound conditioning, bass traps, acoustic MTF testing of playback rooms, attack transient control, the AttackWall control room design and midfield mic acoustic techniques using QSF and StudioTraps in the recording room. The design and construction of Bruce’s studio is carefully gone over, including the all the tricks used to get the high levels of performance he demands of the acoustic space he works in.